“Regression” is a commonly used phrase in the baseball community, particularly among those who consider themselves statheads or sabermetric-minded. It’s even popular among fantasy baseballers. Listen to a fantasy baseball podcast and I guarantee you’ll hear the word “regression” at least 49 times. It might become redundant, but it’s important to understand and expect regression, especially if a player has a stat that looks like an outlier and/or is getting up there in age. Take Gary Sanchez of the New York Yankees, for example. Forty percent of his fly balls flew out of the park in 2016. There’s absolutely no chance he repeats that. If he does (he won’t), his home-run-to-fly-ball ratio would be the highest of any qualified hitter in Major League Baseball history. Sanchez has terrific power for a catcher, but even Barry Bonds’ fly balls didn’t carry that much. Sanchez will regress, that much is certain. Like the Yankees’ backstop, there were a few players on the Milwaukee Brewers last season that produced numbers that are more than likely unsustainable. Villar is coming off a .373 BABIP, meaning 37 percent of his batted balls went for hits. To put that in perspective, he ranked fourth in MLB in that category, and he was better than Mike freakin’ Trout. Right away, the odds of him sustaining that high of a BABIP are extremely low, just because that’s insane. But there are other warning signs, as well. Villar hit the ball on the ground 55.6 percent of the time in 2016, which doesn’t leave much room for other types of batted balls, including line drives. In order to try and predict his regression, I looked at every player who was within about three percentage points of Villar’s GB%, so I could see how their BABIP compared to the Brewers’ infielder. This list actually shows the 14 players with the highest GB% last season — which illustrates just how frequently Villar put the ball on the ground — and out of all these guys, Villar’s BABIP was far and away the highest, which essentially points to automatic regression. Now, keep in mind that league average batting average on balls in play is usually around .300, and aside from Span, every player above exceeded that, so Villar is still likely to as well. He has the speed which allows him to use ground balls to his advantage — which is why most of these players have admirable marks — but while Villar’s BABIP probably won’t crater down to earth like President Donald Trump’s approval rating, it’s definitely going to drop closer toward the mean (.333) in 2017, and as a result, his overall offensive production will falter a bit. During the last two seasons, Braun has looked like the same fearsome hitter that he was when he produced MVP-caliber campaigns back in 2011 and 2012. He has 55 home runs during that span, 30 of which came last year, and while that has been an impressive run, it’s likely going to come to an end, as Braun is about to experience some serious home run regression. Above is a chart of Braun’s HR/FB ratio over the course of his career. His fly balls have always carried over the wall at a higher rate than most other players, but 2017 was an entirely different story. Braun not only posted a career high with a 28 percent home-run-to-fly-ball ratio, but he actually led all of baseball in this statistic, and it wasn’t all that close, either. Before last year, Braun never even came close to hitting 25 percent, much less flirting with 30, so predicting a home run regression isn’t exactly a shot in the dark. Not to mention the fact that he recently turned 33, and power usually evaporates with age. 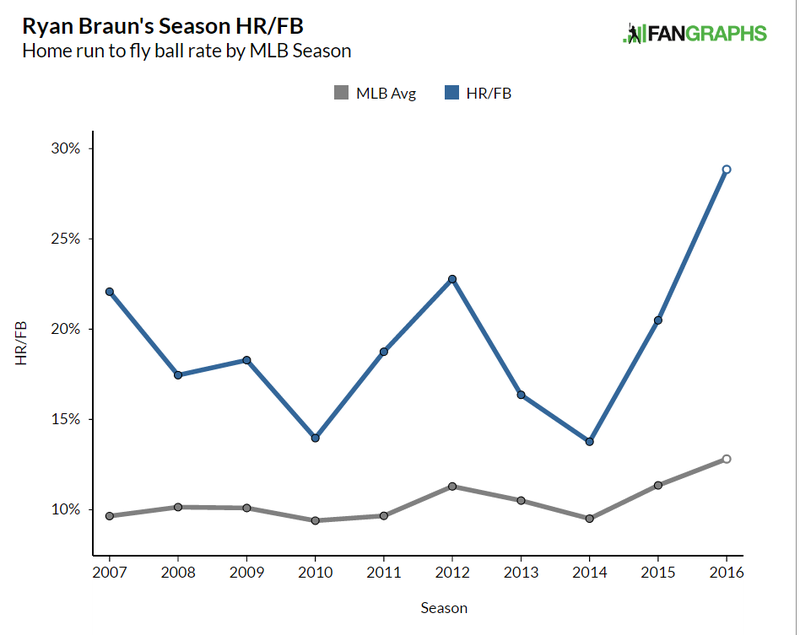 Braun turned in one his best seasons in recent memory, but if his fly balls stop carrying out of the ball park, can we really expect him to put up similar numbers? Guerra came out of nowhere and provided 2.5 WAR in 20 starts for the Brewers last year, second only to Zach Davies. He’ll battle Davies for the right to start on Opening Day, but it’s unwise to believe he can repeat a 2.81 ERA. Just look at his peripherals. His 3.71 FIP and 4.29 xFIP are huge warning signs going into 2018. Those two marks were considerably higher than his ERA because he wasn’t much of a strikeout pitcher, had some issues with walks and kept the ball in the park at an alarming rate — all of which suggest that regression is about to hit him hard. The then 31-year-old rookie was also quite lucky last season. His .250 BABIP was the fifth-lowest mark among starting pitchers (min. 120 IP), just ahead of Clayton Kershaw and a fraction behind Kyle Hendricks. And even when he did allow hits, he did an unusually terrific job at stranding them, as is evident by his 79.4 percent strand rate. Steamer projections are predicting him to fall off a cliff with a 4.32 ERA, and while I could definitely see that happening, that may be a bit too much projected regression. This entry was posted in Analysis and tagged Jonathan Villar, Junior Guerra, Milwaukee Brewers, Ryan Braun on February 18, 2017 by Justin Schultz. Let’s play a game. You like games, right? Good, because we’re going to pretend I’m the manager of the Milwaukee Brewers, and I get to pick the starting rotation. Game on. The Milwaukee Brewers starting rotation posted a combined 4.40 ERA and 8.5 WAR in 2016, ranking 17th and 20th, respectively. A good portion of the rotation’s WAR came from Zach Davies (2.8) and Junior Guerra (2.5), but overall it was just slightly below league average, despite you probably thinking otherwise. With no big-name free agent starters added to the pool, Milwaukee’s pitching staff doesn’t figure to be too much better in 2017, especially if the team rolls out the same lot it did a year ago. But is that really going to happen? Guerra and Davies are my top two pitchers and are definite locks to make the rotation. RW23 believes Guerra and Davies will see some regression this upcoming season, but not nearly enough to cause alarm. They should still be the best pitchers on the Brewers. Notice how Garza isn’t listed among the top five. Given how much the Brewers are paying him, that’s a rather big surprise, but his stats back it up. Garza continued to prove he was one of the worst free agent signings in history by accumulating a 4.51 ERA and 4.33 FIP last year, bringing his Brewers total to 4.59 ERA/4.27 FIP across the last three seasons. He’s no longer a viable starting pitcher, and odds are he’ll only be worse this season. As manager, he will not be a part of my rotation. I’m going to stick him in the bullpen where he’ll hopefully eat up some innings as a long reliever. I’d cut him, but he’s owed $12.5 million in 2017, and that’s a lot of money to pay someone to not be on the team. Like Garza, Wily Peralta and Jimmy Nelson also struggled mightily. Peralta so much so that he was sent down to the minors to try and get right. Nelson, instead of taking another step forward, fell back and posted the highest FIP (5.12) of his career. Still, there’s upside remaining with both of them, more so with Nelson’s side, though. Walks really hurt him last year, along with the home run ball, and If he gets those things figured out, we should see some improvement. As for Peralta, well, I think we know what we’re going to get from him. He’s at best a No. 4 pitcher, and that’s being generous. He needs another chance to return to his 2014 form, though, so I’m going to give him one. Peralta and Nelson, welcome to my rotation. I’m going with Tommy Milone to round out my rotation. He’s been a better pitcher throughout his career than Anderson, and it’d be useful to have a southpaw in the mix. Milone has been underrated throughout his career, and I’d like to see what he can bring. Milone’s in at No. 4 just to break up the string of right-handed pitchers, but I also wouldn’t be surprised if he outperformed Peralta. Regardless, that’s a rather uninspiring group, and it honestly might develop into the worst rotation in MLB if it stays that way. Help is on the way, however, as Josh Hader should be just a few months away from breaking the rotation. I don’t believe he’ll make the roster right out of spring training, but if he does, he should absolutely be in the rotation. I’m not buying him as a reliever. He’s more than that. Taylor Jungmann isn’t on here either, solely because I don’t think the Brewers have any faith in him. They have Milone on their depth chart over him, for crying out loud. Until the Brewers are ready to compete, they must adapt to an iffy starting rotation, as underwhelming as it may be. It’s forecasted to be another long season in Milwaukee. This entry was posted in If I Were Manager and tagged Chase Anderson, Jimmy Nelson, Junior Guerra, Matt Garza, Milwaukee Brewers, Starting Rotation, Tommy Milone, Wily Peralta, Zach Davies on February 8, 2017 by Justin Schultz. For the first time in its two-and-a-half year existence, The First Out At Third will feature real projections rather than educated guesses. I’m very excited to announce the creation of RW23. RW23 is named after my favorite (and greatest) baseball player of all time, Rickie Weeks. I’ve loved him from the moment he made his Brewers debut and I shed many tears during his final game in Miller Park, although he wasn’t even given an at bat. I own a banner of the legend that used to hang up in the stadium, and his is the only autograph I truly cherish. Naming my projections after him was a no-brainer. Now, RW23 isn’t a scientific or mathematical, computer-based model. It relies on relatively simple formulas that are entered into Excel. I’d be remiss if I didn’t give Mike Podhorzer and his book “Projecting X 2.0” credit, though, since I purchased his book to aid me in my quest. I made a few small changes and added a bit of my own sauce to it, but there’s no way I would’ve been able to do this without Mike’s book. This entry was posted in Uncategorized on February 2, 2017 by Justin Schultz.